Meet the simplest and most effective permanent springing system for flatwork ironers. The padding of a flatwork ironer consists of two elements: a base level of springs and a top cover of needle-felted fabric. This combination fulfils a number of very important functions as follows. It drives the work through the ironer so that the product being ironed is sliding across the metal bed plate and is being polished on one side. It provides a porous layer so that the suction fans can extract the moist air through it. It takes up any manufacturing tolerances between bed and roll so that the pressure remains evenly distributed. of product being ironed such as hems etc. Springpress is the simplest and most effective permanent springing system available, outdating all other conventional flatwork ironer padding systems. Constructed of a continuous wire formed into springs side-by-side on a continuous metal strip, Springpress is simply spiralled onto most existing ironer roll to produce a uniform covering of springs. To complete the system, two turns of a standard needled textile are placed over Springpress. Springpress is manufactured in various heights and tensions to suit most flatwork ironers. 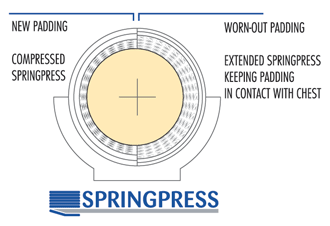 For laundry presses, Springpress is available woven into a pad which can then be cut to fit any size or shape press (springmat). Why is Springpress superior to other padding methods? Full contact between ironer roll and chest is essential to achieve production levels an ironer is designed to reach irrespective of the condition of the fabric clothing: new or old. 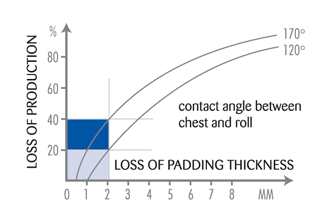 A loss of padding thickness as small as 2 mm reduces the production of an ironer with a 170 degree contact angle by 40 %! Due to friction and compression, even the highest quality textile padding will compact and wear out. Because of the elasticity and compression properties of Springpress, the textile padding will be held in full contact with the chest until it is completely worn out. Full ironing production is thus ensured throughout the life of the textile padding. Over 100.000 ironer rolls have been covered with Springpress and it is the original springing system used by over 85% of the world’s ironer manufacturers. Why use SPRINGPRESS on your ironer? Perfect contact between roll and chest is obtained immediately and maintained throughout the life of the textile padding. No textile break-in period. Constant maximum output. Adapts perfectly to all uneveness of the flex chests. Thinner textile paddings provide better venting of moisture through the vacuum system, and quicker drying of textile paddings when no vacuum system is in use. Thinner textile padding is less expensive and easier to install. 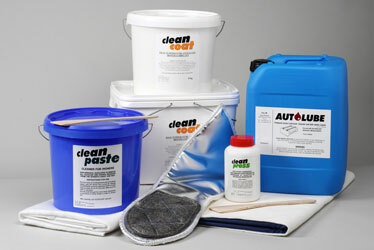 Doesn’t require a textile specialist for repadding. Extended padding life. No need to constantly add to textile padding to maintain roll diameter. Springpress compresses when textiles are new, and compresses less as the textile padding wears. Localized high points like buttons, hems and embroidery compress individual spring more, while holding surrounding material in contact with the chest. Diminishes wet spots and crows feet. 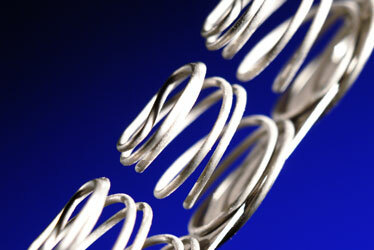 Springpress uniformly spreads the total ironing pressure over the entire surface. Full contact between roll and chest during entire life of textile padding. No energy loss. Constant roll diameter so all available heating surface is used for drying. More efficient heat transfer. SPRINGMAT is made out of woven SPRINGPRESS elements. SPRINGMAT is the only system where pads can be fieldadapted to any pressplate. We took our caps off to you 45 years ago. Much publicity has been made about adding caps to the top of coiled springs, claiming that this provides benefits. Contrary to these claims, intensive research and testing done over 45 years ago proved just the opposite! Many leading manufacturers of flatwork ironers in the 1960’s and 1970’s provided rolls equipped with individual coil springs including caps on top. SPRINGPRESS was developed and perfected without caps after considering the input of the engineering departments of these manufacturers. The following are the ADVANTAGES to SPRINGPRESS without caps. No caps to come off. Anyone who has replaced needlefelt padding knows how hard it is to peel off. SPRINGPRESS has no hooks and still holds the padding so that it never moves. A problem with caps is that the fibers of the padding adhere to them, and the hooks in the caps make it worse. Eventually, replacing the needlefelt will cause some of the caps to come off, resulting in a wet spot forever! 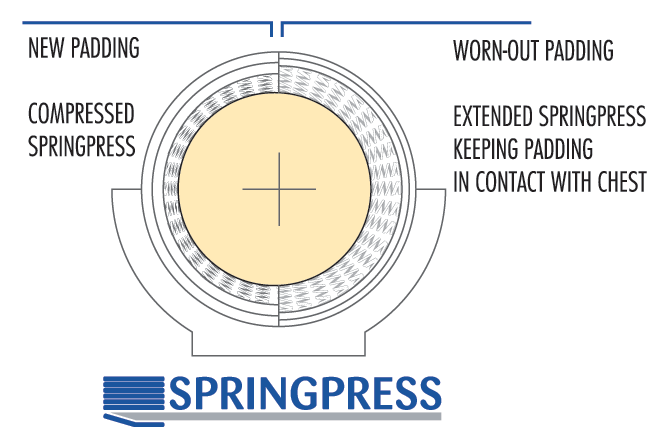 If a severe jam should occur in the ironer, SPRINGPRESS springs may slide along the strip, but this causes no real damage and can be easily repaired with a screwdriver and pliers. If a severe jam occurs in an ironer with springs that cannot move and have caps, many times the wire or strip breaks. In other cases, the caps bend backward and sit at a 90 degree angle, which causes them to perforate through the padding and scratch the chest. As users of laminated springs know, the adhesion of old padding to the springs is so great that pulling it off causes the height of the springs to increase, making it necessary to re-calibrate the springs before re-padding. The same thing happens when caps are on the top of coil springs. They become elongated and without re-calibration, result in overpadded rolls and loss of padding life and production. Solid metal stops water droplets. The solid metal portion of caps prevents water droplets from escaping through the exhaust system without finding a way around the solid barrier. This reduces the drying capacity of the ironer. Eventually the padding becomes clogged and the vacuum system removes less evaporated moisture. Perforated strips and punched caps are not needed for sufficient exhausting of water vapor. The space between wires of SPRINGPRESS and underneath the strip is always greater than the sum of the roll perforations, so the vacuum system is properly balanced with SPRINGPRESS. Too much vacuum will cool down the ironer, which is a disadvantage when trying to dry wet material. The small diameter of SPRINGPRESS divides the pressure much more evenly, resulting in better ironing quality. Coiled springs with caps have much larger diameter than SPRINGPRESS without caps. Each square meter of ironing surface holds only 2.200 coiled springs with caps, compared to 4.600 SPRINGPRESS springs for the S type or 6.400 SPRINGPRESS springs for the H type. The result is less ironing quality for the springs with caps. The conclusion is that caps on coiled springs are a step backward, not an improvement. This is a classic example of trying to be different only to have some sales arguments. This is definitely not in the best interest of the end user!